We provide Landlord or Home Owner Gas Certificates to all areas of Liverpool & Merseyside. All our certificates are inclusive of checking 3 other appliances in your property too, if necessary. All rental properties are required by the Gas Safety (Installation and Use) Regulations of 1998 (PDF) to hold a valid Gas Safety Record (CP12 form). A gas safety check is required by law annually and must be issued by a Gas Safe® Registered Engineer. All gas appliances in the property must be checked and the tenants have a right to be handed the Gas Safety Record by law. If you are a landlord, you are held responsible by the Gas Safety (Installation & Use) Regulations of 1998 to ensure all gas appliances, flues and fittings in the property are deemed safe and working correctly. Poor maintenance and safety checks can result in extremely dangerous carbon monoxide being leaked. For example, if your flue is operating incorrectly, it will not be efficiently removing the resulting gases from combustion. As documented above, a Landlords Gas Safety check must be completed every 12 months. You must ensure the regular maintenance and repairs of flues, appliances, pipework in the property. This only applies to appliances you supply to your tenant. 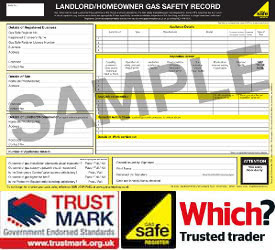 As a landlord, you must issue a copy to your tenant within a time frame of 28 days from the certificate being completed by a Gas Safe Registered engineer. Gas Certificate appointments to coincide with our customers schedules. Up-front and clear pricing structure. All our certificates are a fixed cost. Gas Safe® engineers will perform the safety checks and complete the certificate. Gas Safe® Registered (CORGI) - all engineers. No hidden costs. Our certificates cover your boiler & 3 appliances. Q: What happens if my property fails the Gas Safety Inspection? What does 'Not to current standards' (NCS) mean exactly? A: During the gas inspection, dangerous situations may be encountered which we are legally obligated to make safe. This can result in an appliance been 'capped' or disconnected from the gas supply. The engineer will explain to you why we have had to take immediate action. We can provide you with costings to carry out the required repairs to rectify the dangerous situation. You are not obligated to have the remedial work carried out by ourselves. We do not want to fail appliances by default to quote for corrective action. If the property is safe, the certificate will pass. The vast majority of gas certificates we conduct pass inspections. Reports may contain references to an appliance (or an aspect of the installation) being 'Not To Current Standards' which is abbreviated to 'NCS'. This usually means that since installation the regulations have been updated. This will not cause the gas certificate to fail but will contain advice on remedial work required. You can then decide on the recommended remedial actions. Q: What are my responsibilities as a Landlord renting my property to the general public? You must provide maintenance of all pipework, flues and appliances which you have supplied. If the tenant has provided their appliances, you are not responsible for them, but you would be responsible for the gas pipework supplying the appliance. Appliances should be serviced in regulation with the manufacturers' instructions. It is also good practice to explain to your tenants where the gas can be disabled from. You must by law ensure yourself, and the landlord is in the clear understanding of who is responsible for the annual gas safety checks. This is usually explained and stated in the contract. As the agent, you must ensure this is clear between you and the landlord. If you are in doubt of the properties gas installation, you must inform the landlord. You must also ensure the company or person doing the inspection is Gas Safe registered. Q: Can you remind me annually when my gas certificate is due? A: Yes. When we complete a gas certificate, you will be notified a month from when the next is due. We usually do this via email. A: Usually between 30-45 minutes, depending on the number of appliances in the property. A: All our Gas Engineer are Gas Safe Registered under our business gas safe identification (located at the top of this page). You can also ask to see their Gas Safe I.D cards on arrival. A: Yes. Please let a member of staff know you would like a digital copy when booking in the gas certificate appointment. A: It is highly recommended you do, yes. They are cheap and can save lives. They are not a substitute for an annual gas safety inspection. You can usually pick them up for around £10.00. Ensure they comply with British Standard EN 50291 and have a British/European approval mark. Q: What areas of Liverpool do you carry out Gas Certificates in? A: All areas including all areas of Liverpool, Wirral, St. Helens, Knowsley. Please view our service areas. If in doubt, just give us a call. Q: Must my tenant allow access for the certificate to be completed? A: Your contract should state you are allowed to access the property for necessary safety checks to be conducted. If you are struggling to gain access to the property you should document all your attempts including letters sent. This will show your efforts in seeking to gain access. A: This is a common misunderstanding. The gas safety check only includes inspection of the properties gas installation and appliances, including checking for any leaks and testing safety devices are working correctly. This also includes checking the flue, ventilation and checking the gas is being combusted correctly. A standard certificate does not include any repairs which we may recommend. Servicing, for example, a boiler service, is recommended for keeping the boiler in good working order and is an independent service to the gas safety inspection. Q: Must I pay for the gas safety inspection if it fails? A: Yes. The certificate will detail what requires being done for the certification to pass. Q: We/I have multiple properties in Liverpool and would like gas inspections carrying out. Do you offer bulk discount for landlords? Our Gas Certificate Inspections are available to all areas of Liverpool (Merseyside), Wirral, St. Helens, Knowsley and Sefton. Please click Expand to view a list of areas our gas certificate inspections apply to. If you are not sure, please give us a call.